Lapointe, Pierre Louis. "Pointe-Claire". The Canadian Encyclopedia, 04 March 2015, Historica Canada. https://www.thecanadianencyclopedia.ca/en/article/pointe-claire. Accessed 22 April 2019. Pointe-Claire was first set up as a village municipality under the name of Saint-Joachim-de-la-Pointe-Claire in 1854. Its name was shortened when it was incorporated. 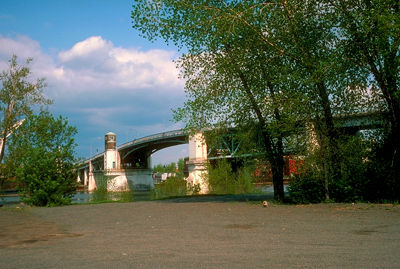 Pointe-Claire, Qué, City, pop 30 161 (2006c), 29 286 (2001c), inc 1911. Pointe-Claire is a residential suburb of MONTRÉAL and a member of the Montréal Urban Community. This west island city is located between DORVAL to the east and BEACONSFIELD to the west. It is about 20 km west from downtown Montréal. Pointe-Claire was first set up as a village municipality under the name of Saint-Joachim-de-la-Pointe-Claire in 1854. Its name was shortened when it was incorporated. The original Roman Catholic parish of Saint-Joachim (1714) was centered on a point of land jutting out into Lac Saint-Louis, designated as Pointe-Claire as early as 1684 by Nicolas Perrot, a fur trader and explorer. The &QUOT;clear view&QUOT; offered to those who looked out unto the lake from the point of land explains the origin of the name. The church (1884), convent (1867) and mill (1708) still stand on that site. Pointe-Claire was at first a small village and summer retreat for Montréalers. The old village still retains much of its earlier charm including Stewart Hall, now the city's cultural centre. The city is the commercial centre for the west island.